This is where things get a bit tasty. The R6 is jammed packed with some excellent processing and decoding hardware for its price point. Both DAC and processor are light years ahead of some of the competition. The R6 uses a dual ESS Sabre ES9028Q2M DAC design, one per channel. It is not quite PRO level such as you would find in the DX200 but it is nevertheless part of ESS’s latest DAC chip rollouts. The Q2M range is still considered high fidelity but it is primarily focused on portable audio equipment as opposed to desktop solutions or solutions that can cope with high power consumption demands. As such the power consumption of this design is a little lower and one of the factors in the better than expected battery life numbers for the R6. In terms of decoding prowess, the R6 is bang up to date. Even more so with the Snapdragon processor if you happen to be working with very high bitrates or depths up to DSD256. The full range is as good as any other DAP out there including native DSD256, DXD, and DST ISO decoding. It will also process most popular lossless codecs such as APE, ALAC, AIFF. FLAC, WAV, and WMA. Maximum conversion rates are 384kHz/32bit for most lossless files. The exceptions are APE extra high (192/24), Ape Insane (96/24), WMA Lossless (96/24), DXD (352.8k), WAV (384/64). Like its big brother, the Q2M also has a set amount of digital filters. In this edition, I see 3; minimum phase, fast roll-off and slow roll-off. Compared to the DX200 it is not as extensive with only 3 activated compared to a possible 7. HiBy may stick with these 3 in the short to medium term as the official explanation is that these are the most suitable for general listening. HiBy Music’s choice of the Qualcomm Snapdragon 425 is arguably as much of a difference maker to the UX of the R6 as is the dual DAC design. As you will see below in our performance reports it is lightning fast compared to the older Rockbox SOC designs on the FiiO DAPs. It is also faster than the DX200’s 8 core 64BIT ARMv8 processor though the DX200 does edge ahead in graphics performance due to a dedicated PowerVR Rogue G6110 GPU. I personally think where iBasso missed a trick was the use of only 2GB with Android 6. It has potential to be a bit faster. FiiO has gone with 2Gb but sensibly stuck with Android 5.1 to maximize it. HiBy have seen the light and stuck in 3GB of RAM with Android 6.1 which is much more sensible. The result is a very snappy performance even under considerable decoding or multitasking loads. The R6 uses a dual OPA1612 x 2 for its low pass filter and a dual TPA6120A for its amplification output. The configuration for balanced is a dual mono output with 98dB of channel separation with 77dB for unbalanced. Output power is rated at 120mW under a 32-ohm load for unbalanced and 300mW for balanced. Line out is a standard 2V line out and should work well with most analog amps. 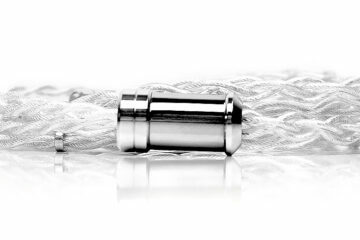 The numbers are very good in terms of power and SNR and tread a middle path between getting the noise floor just right for sensitive IEMs and providing good enough power for less efficient gear. 120mW unbalanced is slightly less powerful than the new AM3a amp card from FiiO but the R6 amp does have slightly superior channel separation. The SNR is not quite as good as the AMP 1 card from iBasso which boasts a 125dB balanced and 122dB unbalanced though superior to the AMP 2 card by 1-2dB on both outputs. 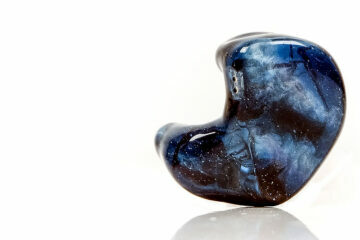 The R6’s SNR is more or less the same as the FiiO AM3a in both balanced and unbalanced output. The closest in terms of absolute power at a 32-ohm weighting is the FiiO AM2 card at 300mW (unbalanced). HiBy has stuck a large 4000mAh Li-polymer battery inside the R6 that might account for some of that additional weight also. With that battery, you get a better than average 12-hour rating unbalanced and more than acceptable 7-hour playback time for balanced output. In standby mode with minimal use, the battery monitor is recording between 16 and 24 hours though theoretically, it can be up to 100 hours standby with minimal apps usage and a clean OS. 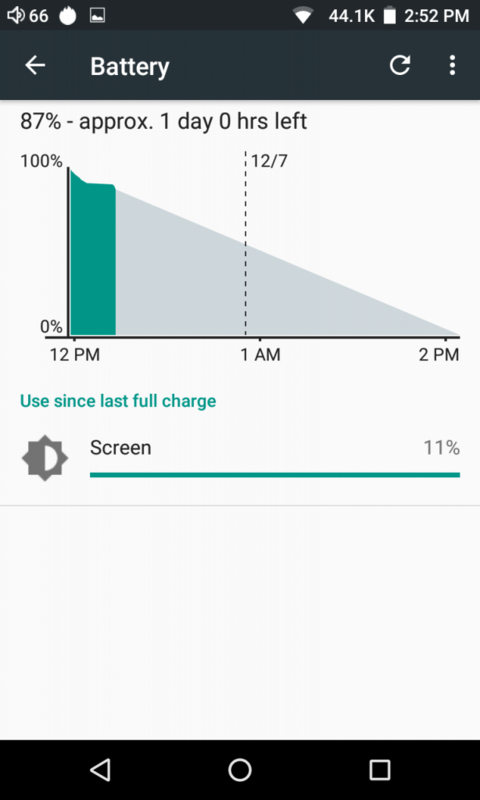 Charging time is a really nice and quick 70 mins to 70% and 140 mins to 100% using the Qualcomm quick charge system on a 9V/1.5A connection. That is a little faster than the X7ii using a more powerful DC 12V/1.5A connection. Compare that with the X7ii (3800mAh) with the AM3a at humbler 8 hours in unbalanced mode and the DX200 (4800mAh) equally frugal 8-10 hours and you begin to see the picture. I spoke about trade-off in terms of power, processor, and DAC and potentially 12 hours battery life is one of the more positive aspects of the balance between performance and longevity on the R6. 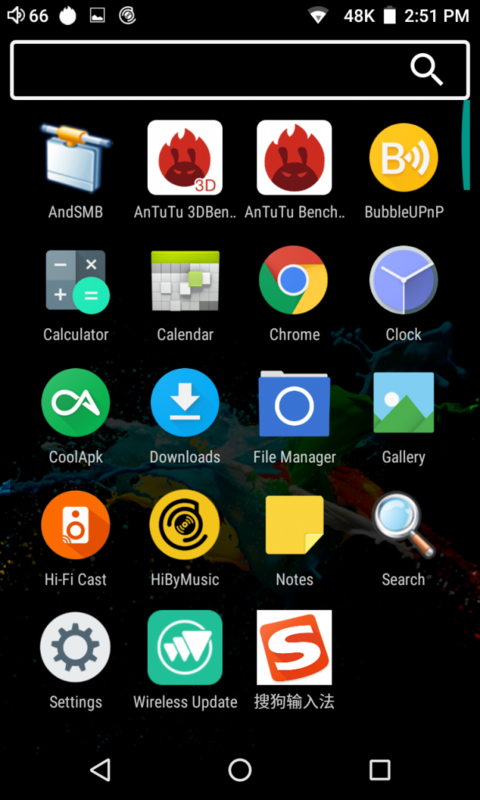 HiBy Music has opted to use Android 6.01 as their core software platform for the R6. Combined with the 3Gb of RAM and Snapdragon processor it is a substantially better performing DAP OS than I have seen on competing products. It is also a very open version with next to no bloatware or walled in design such as you would find on the Opus and AK series of DAPs. This is more akin to FiiO and iBasso’s free and open software. 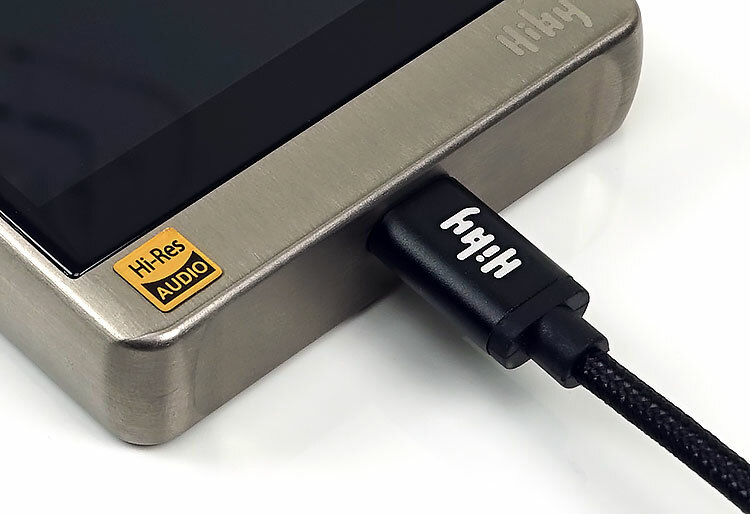 You do get HiBy Music app as standard out of the box though there is no option to dual boot into HiBy Music unlike FiiO’s Pure Player and iBasso’s Mango OS. I do have to make some advance caveats as the version I have is not as complete as the version people will receive on the Indiegogo campaign. There is no USB-DAC functionality currently enabled on the R6 nor is there any Google Play services installed. You cannot sideload Google Play services and Google store on the firmware I have. I have tried and it crashes. It will, however, be on the international launched firmware. Finally, I have no HiBy Link functionality as yet on this firmware but it will be on the next one for you to enjoy. Without Google Services and Google Play APK all apps management is done through side loading. Basically, loading apps onto a memory card and then using the stock file manager app to install them on the R6. Out of the six or seven apps I loaded only those that required Google Services to operate, such as Hificast, did not install and operate successfully. 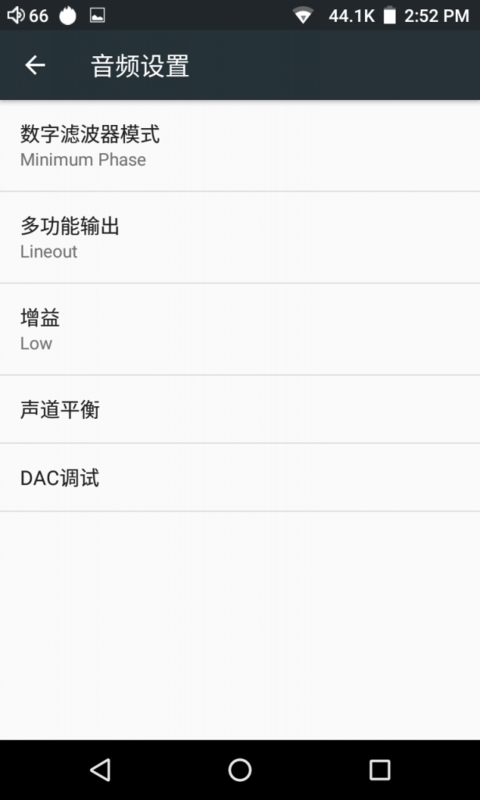 Apps such as BubbleUPnP and Antutu installed and worked just fine. The Chinese market currently has access to alternative apps from the installed Cool APK marketplace to download whatever they want but I highly doubt we will see this on the international version when Google Play comes as standard. 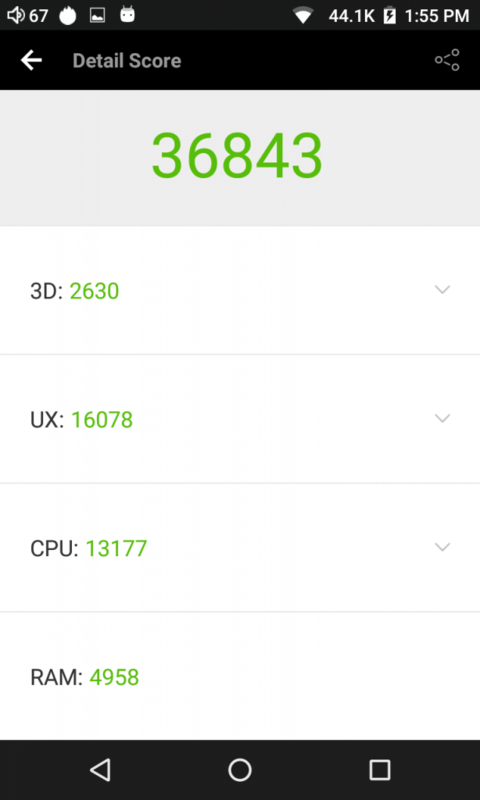 The Antutu results of the R6 are the best results I have seen to date in terms of operational stability and performance of Android on a DAP. The ranking information positions the R6 as that of a mid-performing smartphone which is excellent considering smartphones are generally geared for speed and graphics rather than pure audio. Of particular note was the general usability or UX score which was 3k points higher than the X7ii and 6k points higher than the DX200. Also, both RAM and CPU performance scores were noticeably superior to both DAPs. Apologies for the lack of quality on the DX200 screenshot, it was done a while ago and I wanted to retain the out of the box performance score rather than the score now with a lot of apps loaded. The two contrasting scores are like for like in terms of app weighting. As you can see the dedicated GPU chip inside the DX200 delivers superior 3D rendering performance over the R6. Apart from that, the R6 is miles ahead in processing and RAM performance. The knock-on effect is the entire UX experience score is much higher and its final score is an almost 50% increase on the DX200. What that means is the R6 suffers from next to no lag, especially on touch to response on the screen which the DX200 can be prone to at times. It also means that the claim that the processor and RAM level should provide a better DSD experience is likely to be true. 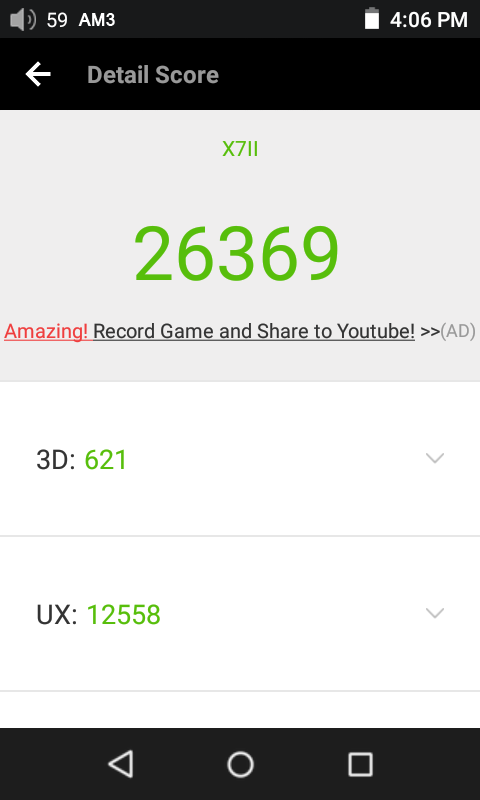 I couldn’t get a clean full-page screenshot of the X7ii scores but suffice to say the 3D performance of the X7ii is the poorest of the three and should not be considered for anything heavy duties GUI wise. The X7ii scores a little better on CPU with a score of 10116 and UX is also slightly better at 12558 over the DX200. I attributed that to the use of 5.1 over 6.0 in the X7ii with 2GB of RAM being more effective in the X7ii. Compared to the R6 the Snapdragon processor and additional 1GB of RAM makes a huge difference. 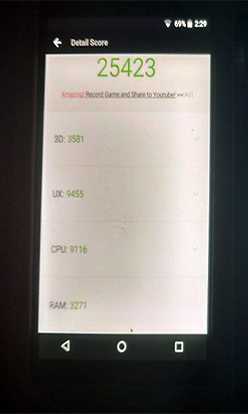 The RAM score is 3074 compared to the R6’s 4958 which is a big gap. Multi-tasking is much faster on the R6. In real-world testing, you will see it also in the quick response rate of the R6’s HiBy Music app and the slightly laggy performance of the X7ii’s Pure Music player. All of this makes the UX performance of the R6 at 16078 a very tough score to beat. 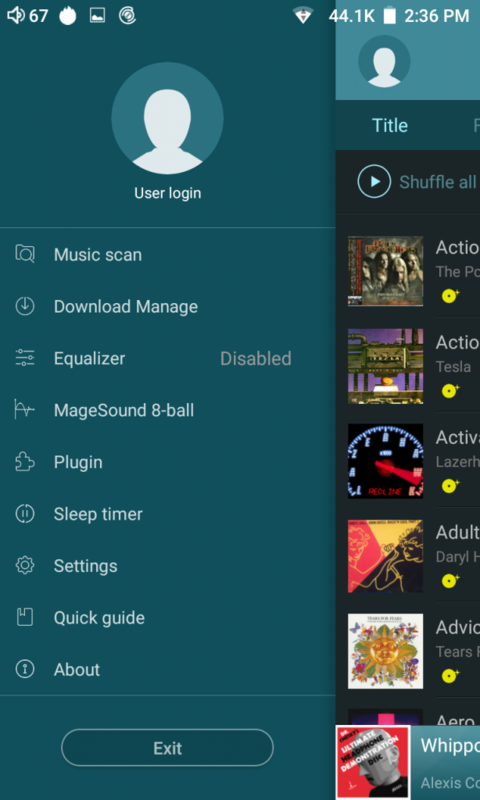 The HiBY Music app should be fairly familiar to most DAP enthusiasts and it is one of the easiest music apps I have used in the last few years. Note, the R6 has no dual boot functionality so you will have to load it via the Android platform. The use of DTA technology renders dual-booting moot as it allows the app to bypass Android’s sample rate conversion (SRC) to give you a BIT-perfect output. Settings are two-fold. 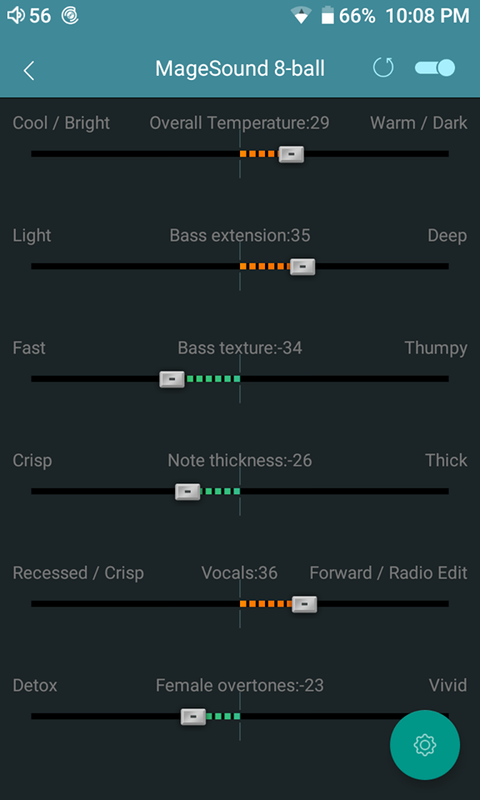 The general settings of Android 6.0 and the specific settings of the HiBY Music app. In the Android settings, you can tweak the usual features like WiFi, Bluetooth pairings, apps management as well as security and updates. 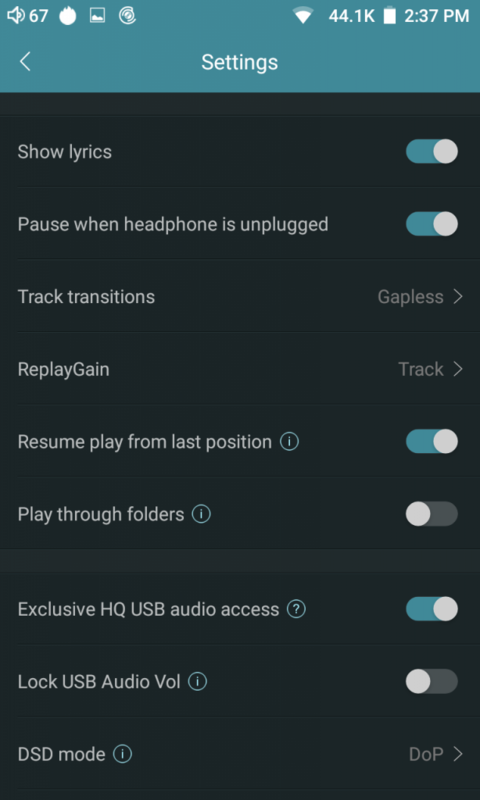 In the HiBY Music app, you get setting specific to the app and more focused on audio playback. These include file scanning and library building, equalizer settings, plugin management and a quick guide on how to use the app. Deeper in you also have the HiBy Music app’s own settings which go a lot deeper into customizing the playback performance and environment. It is pretty comprehensive and if you are coming from the smartphone app you will find it goes a little deeper with more customization options. These include the capability to show lyrics. gapless playback, replay gain, play through folders and DSD mode. DSD mode can be switched between PCM, DoP and Native. It does not have a driving friendly mode but in return, you do have more control over track transitions such as Fade in and out and inserting a period of silence. You also have one other major new feature which is not currently available on the HiBy Music app on other platforms and that is the Magesound 8-Ball plug-in. I was first shown this last month at the show and I believe the version you will get will look a little more refined but essentially do the same thing and perform in the same manner. This is an awesome app if you pardon my lack of technical phrasing. Rather than simply offer an equalizer and a series of presets (which it also does in another setting) the 8-ball targets certain things we audiophiles tend to think about when we describe the sound and what we want or do not want. The list is like a wish list of controls I wish I had years ago like affecting the overall tonal temperature from cool to warm, flattening out the bass texture and note thickness, recessing the vocals, pushing them forward and control of sibilance and injection of air. This is some promising DSP. 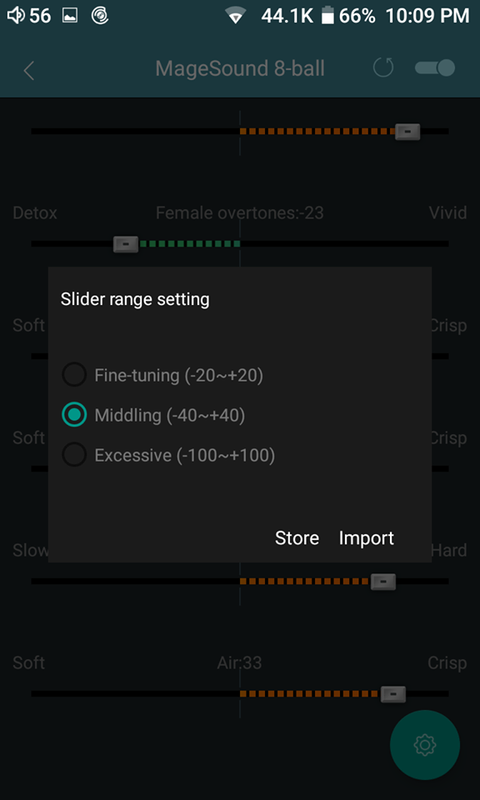 Every category is controlled by a measured slider that can flip between fine-tuning and ‘go extreme’ so you always feel like you have a level of control on just how far you want to take it. The playback and on the fly menu features during playback are the same as the current Android app in the Google Play Store and it looks divine on the 2.5D screen. On the top, you have a small arrow button that allows you to explore your media library during playback. You can return to the playback screen with a small playback bar at the bottom. The R6 also displays its system audio sample rate at the top bar next to the battery icon, not only in the HiBy app but with all third party apps not going for immersive mode (thus dismissing the top bar). If you want to check the claim of bypassing Android SRC using the R6 DTA architecture then have a look there for the proof. To the left of this is a playback order function for shuffle or repeat. To the far right is the playback queue where you can move tracks around to create the playback queue of your own choosing which I have always enjoyed using. 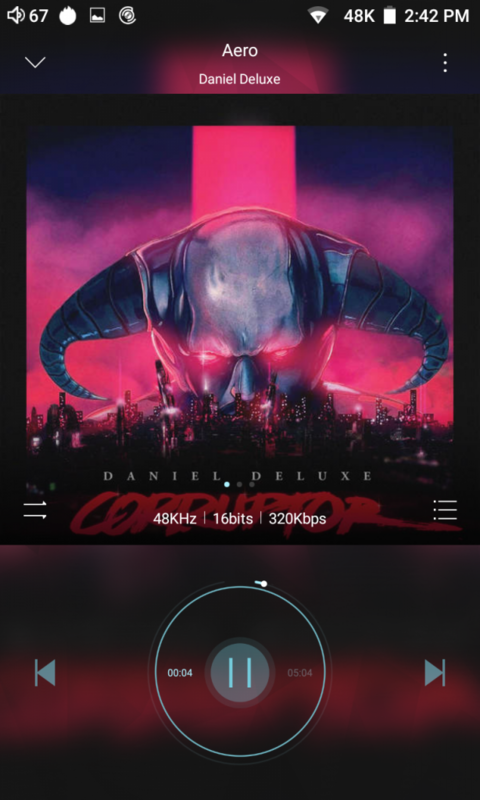 Media Management in the R6 HiBy Music App is exactly the same experience as the smartphone app and pretty similar even to the themed skins you find on the likes of the Cayin I5. Only this time it is much faster. Scanning time is blazingly fast, tag management is on the whole very accurate and the category labels are fairly intuitive. I am glad they used text labels for each category over icons, they are much quicker to understand. 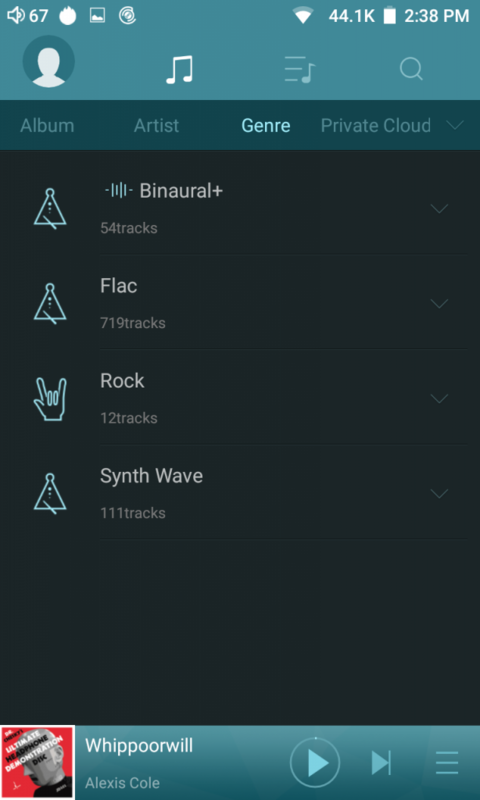 All tracks are organized into song, artist, album, and genre with a further option to connect to cloud storage options. Above the category breakdowns, you have 3 more features which split the functionality between the library management, playlist, and favorites functionality and fairly powerful search feature that can mine the database based on your text inputs. In this particular firmware, HiBY Link is not yet active, it will be in the international firmware release. For further details of how cool HiBY Link is please see our iDAP-6 review released last week which makes extensive use of the duplex BT and HiBy Link services. 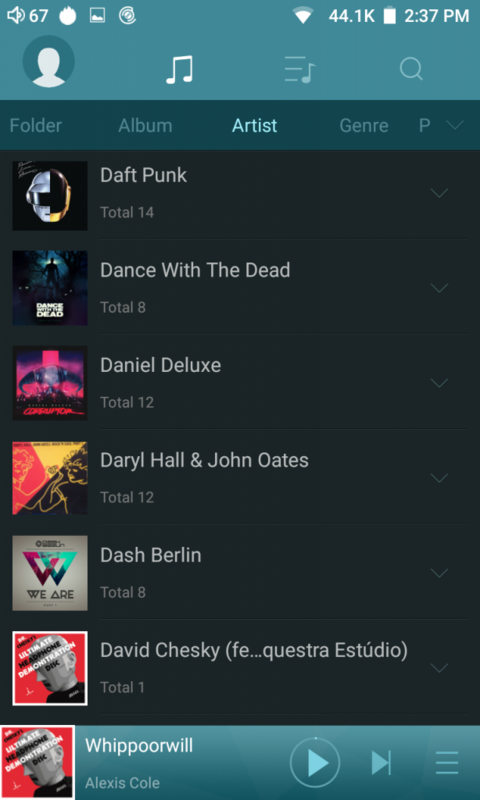 In summary, HiBY will allow you to not only tap into alternative storage services on a BT connection but it will also display them inside the HiBY Music app for you to control and play. It is a fantastic and innovative piece of software that turns the R6 in either a remote control or a remote transport. 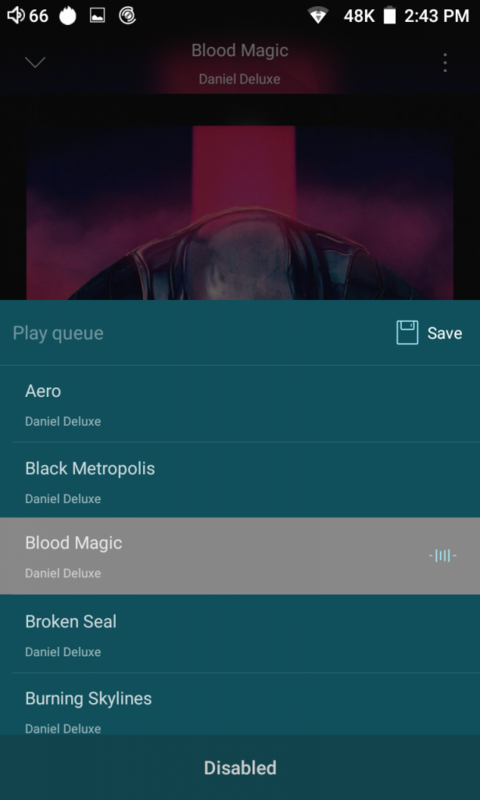 The R6 HiBy Music app also offers a simple but effective UPnP and DLNA cloud service. 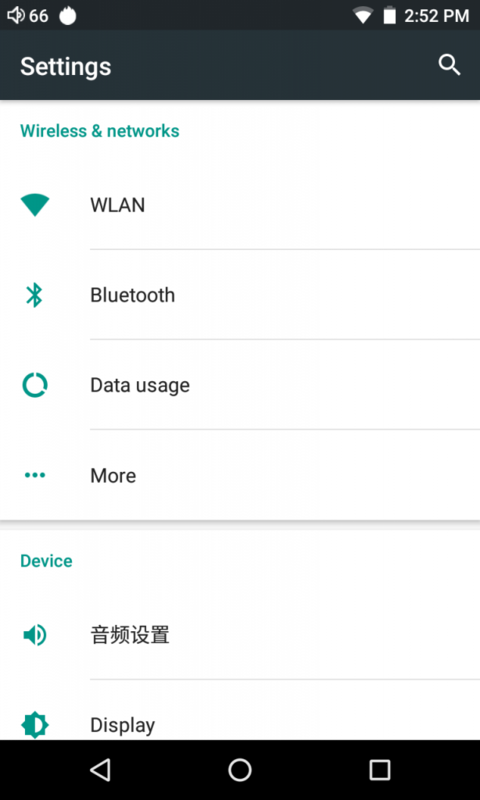 There is also an option to connect to Baidu cloud services for remote storage streaming but I am not sure if that will be available in the international firmware. The DLNA service is an alternative to more comprehensive tools such as BubbleUPnP which also works just fine on the R6. 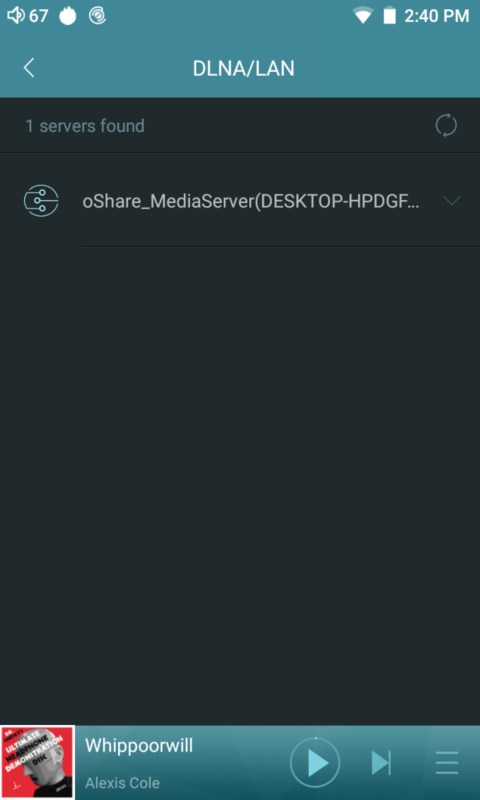 You can tap any source reciprocal DLNA server such as oShare on Windows and render the tracks locally on the R6. How good the performance will ultimately depend on your network connection but otherwise I had no issues browsing, downloading and playing the files from oShare on my own network. I did have some initial startup issues with BubbleUPnP primarily on the codec but you can get around that with the settings UPnP tweaks section by unchecking the Mime-type tick box.